Nepal (BBN)-Aid has begun to reach remote regions near the epicentre of Saturday’s devastating earthquake in Nepal. As relief efforts continue in the Kathmandu Valley, the UN says the response is broadening to include areas such as Dhading and Gorkha, reports BBC. 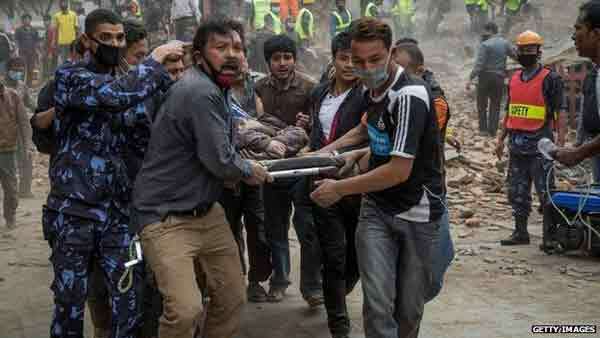 The 7.8 quake has claimed more than 5,000 lives. Many survivors remain in desperate need of food and water. Thousands of people are queuing to board buses and leave the capital, amid fears of further aftershocks. The government is providing free transport for Kathmandu residents hoping to travel to their hometowns. School buses have been sent to supplement overstretched services. On Wednesday, police at the main bus station scuffled with people who had gathered there hoping to leave. Rescue operations resumed on Wednesday following bad weather. In the Gorkha district a convoy brought rice, oil and sugar to the village of Majuwa, AP news agency reported. A helicopter is due to fly supplies to the hardest-hit villages of the region. Many villages in the area have been almost totally destroyed. There are accounts of desperate villagers rushing towards relief helicopters begging to be airlifted. More than eight million people have been affected by the quake, the UN says. About 10,000 people have been injured. Hundreds of thousands of people continue to live in temporary camps, in squalid conditions with very little food and water, says the BBC’s Sanjoy Majumder in Kathmandu. Aftershocks, landslides, severe damage from the earthquake and creaking infrastructure in one of Asia’s poorest countries have complicated the rescue efforts. Anger and frustration have been mounting, with many people sleeping out in the open for a fourth night. On Wednesday, protesters in Kathmandu expressed anger at the slow pace of aid deliveries. We are hungry, we haven’t had anything to drink,” a demonstrator told AP. Officials have acknowledged that they have been overwhelmed by the scale of the disaster and that delivering relief to far-flung villages has been challenging. The UN reported that international search-and-rescue teams have so far been able to save 14 people from rubble. On Tuesday a Nepali-French team pulled a 28-year-old man, Rishi Khanal, from a collapsed apartment block in Kathmandu after he had spent about 80 hours trapped in a room with three dead bodies. Nepal is observing three days of national mourning for the victims.